To new parents previously accustomed to attending art openings, live performances, lectures, or late night music events, it's easy to feel a bit cut off from things once you've got a small child in your life. While it works for some parents to bring baby along, it can also feel distracting, disruptive, or completely exhausting, depending on the event and the kid. Childcare is an option of course, better for networking and paying attention... but breastfeeding, babysitting costs, and bedtime (for those with early-morning wakeup calls) can make that feel complicated for a while, too. "It seems illogical that whilst the first 3 years of our children’s lives are the most intense period of growth and learning, these early years can also be an intellectually barren period for the parents." This is a quote from CultureBaby, a London-based project established by art consultant and mama-of-three Lucie Charkin, who decided to take matters into her own hands. From 2010 - 2012 CultureBaby organized artist talks, gallery walks, museum tours and other cultural outings with families of small children in mind. 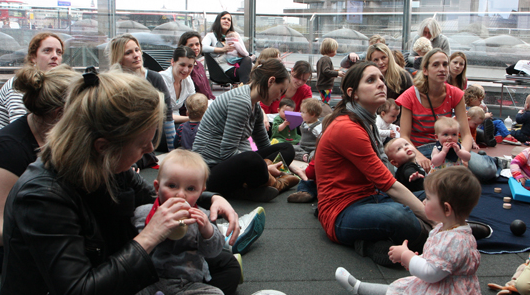 While the events were very toddler-friendly (soft floor mats and thematic activity packs linked to the day's event were often provided), these events were designed to enrich the lives of parents first, allowing them to think and learn alongside their children. The genius of CultureBaby is that they weren't tied to any one institution, allowing them to take over an art fair, network in a public garden, or organize a special event at a new art venue depending on what's happening in town. In fact part of their mission was "to inspire cultural institutions to better serve us and our demanding toddlers by visiting them and expressing our collective needs in a positive way." And who can argue with that? This kind of collective energy is behind a whole crop of activist projects aimed at re-shaping the art world in London: the Whitechapel Gallery hosts a series called Crib Notes, #Prammob (also linked to CultureBaby) whch stages impromptu gatherings at interactive public art events, and Enemies of Good Art, an activist group hosting regular meetings and lectures as well as a guerrilla style childcare-share that converged on the Tate Modern in 2011 to allow moms to watch each other's kids so that they can take turns going to take in the art. Why do art openings have to take place on Friday nights and not Saturday afternoons? 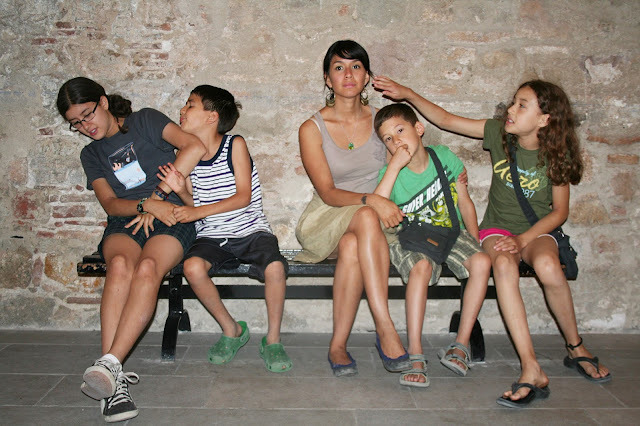 Why can't museums offer morning artist lectures for families? 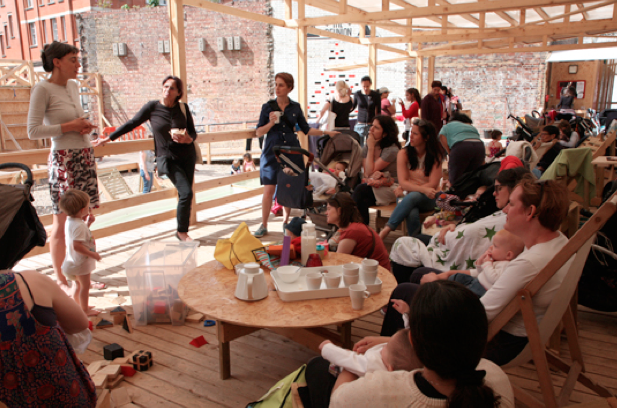 Why don't larger cultural institutions offer on-site childcare during events, like the local YMCA and Ikea do? The answer to most of these, I realize, comes down to money. If we're serious about making the art world a place that considers women and men with families as visible/valid/valued participants (and just as deserving of consideration as other patrons of the arts) then our active presence there is an important first step. Charkin is now based in San Francisco, where she ran a similar project called A Little Culture, and its exciting to think that her energy and mission are spreading. Here in Chicago, we are very fortunate to have great things like JuiceBox, a series of kid-friendly musical performances (including some really excellent experimental jazz), stroller tours of the local Museum of Contemporary Art, and a truly wacky public-access TV show / dance party event called Chic-a-go-go, which invites punk and indie rockers to be interviewed by a puppet and play to a truly all-ages audience. But reading up on Charkin's inspiring events makes me feel like the rest of us have more work to do in activating spaces where parents and kids can get some cultural stimulation. What kinds of opportunities would you like to see in your city? What interesting events are already happening? The Milwaukee Art Museum has a special family program with a alrge art lab, where you can make short animated films with your kid, art projects, draw still lives on easels and more. It's sort of a playdate group, and a chance to go see shows at the Museum while entertaining your children.